Albany's Tim Conboy made the switch to forward from defenseman at the request of Carolina Hurricanes coach Peter Laviolette due to injuries. Albany River Rats defenseman Tim Conboy plows straight ahead into everything else, so he figured he might as well take the same approach toward playing a new position. When Carolina Hurricanes coach Peter Laviolette asked Conboy to move from the blue line to forward during his time in Carolina at the end of the season, Conboy could only promise he'd give it his every drop of sweat. Conboy, usually a low-scoring defenseman, had extremely limited experience up front, but Carolina needed him there because of injuries. "I said; 'Anything that keeps me in the lineup, I'll do it,"' Conboy said. "The first few games up there, it took me a little while for me to figure out what I was doing. I knew a little bit of what was going on. It was still kind of questionable. I didn't make too many mistakes." 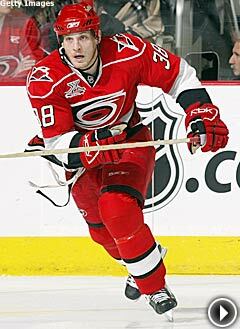 Conboy, 26, compiled 60 penalty minutes and five assists in 19 games for the Hurricanes, his first stretch in the NHL. He returned to the Albany lineup April 9, and, back on defense, scored the game-winner with 50 seconds left in a contest against Norfolk. The 6-foot-2, 225-pound Conboy and the Rats are a perfect match. He's a heart-and-soul guy who is learning how to win, and Albany is a team that is finally giving him that chance. Conboy, a seventh-round pick by San Jose in the 2002 draft, spent his first two pro seasons with the Cleveland Barons. He was a fiery newcomer"compiling 134 and 124 PIM, respectively"but the Barons' poor record and even worse crowds tamped down that fire. Before the 2006-07 season, he signed as a free agent with the Carolina organization. As an immediate blue-line bedrock, he helped turn the Rats into a playoff team again right away. "I think my first year (in Cleveland) we were mathematically eliminated after Christmas break," he said. "It's like my career has been revived again. It's done a 180. This is what you work for all summer long." The son of a Minnesota high school football coach, Conboy is precisely the combative sort of defenseman teams want securing their own end in the playoffs. He piled up 191 PIM in just 52 games with the Rats this season, and facing him game after game in a series just makes him that much more annoying. "I've been playing that way my whole life. Some may call it dirty. I don't know," he said. "It comes from my competitiveness. I like to battle, make it hard for other guys to play. I've been taking heat for it since I was little, (from) opponents, other parents. But it's gotten me where I am today, so I'll never change." Monster attendance in Cleveland -- Lake Erie Monsters COO Randy Domain recently cashed a check at a bank in a suburb of Cleveland. The check bore the logo of the Monsters. The teller noticed the mark, and Domain inquired as to whether she knew who the Monsters are. She said no. A swing and miss? Hardly. It was a chance to make a new fan. "Some people may look at that as bad," Domain said. "We don't look at it as bad. We look at it as an opportunity." Lake Erie hasn't missed many of those this year, at least off the ice. The team's success in a previously struggling marketplace is one of the best turnaround stories in the AHL this season. It pulled in an average of 5,974 fans per contest, and drew three of the top four single-game crowds in the AHL this season, including a season-high 15,408 for their home finale on April 12. The relative throng comes two seasons after a Barons team that limped out of town with no one even knowing or caring. They suffered through game after game of crowds hardly larger than the number of players on the ice. Domain, also director of corporate sales for the NBA's Cavaliers, winced as he looked around the arena in those days. As an employee of the formerly successful Cleveland Lumberjacks of the IHL, Domain knew his city could be a hockey town. "We used to see the Barons, we'd see the attendance, and it crushed us," he said. "We worked so hard at developing a following for hockey (with the Lumberjacks). We didn't know when the disconnect happened." But Domain and his crew knew how to fix it. San Jose, which owned the Barons, shut down shop two seasons ago. Cavs owner Dan Gilbert bought a dormant AHL franchise and moved on in. The keys to the revival of the sport in Cleveland are no secret to anyone with front office savvy in the AHL, but the difference here was the intensity and resources Lake Erie used to attack the challenge. The team has 25 staff members, most of whom are targeted toward sales and marketing. With the Cavs as a brother team, Lake Erie dropped NBA-quality game presentation on its fans. The rich youth hockey market was embraced, with the goal of every player and coach coming to at least three home games and spreading word of the fun. Domain said his team still fell short of its financial and attendance goals"he wouldn't specify them"but at least it moved in the right direction more quickly than most would have guessed. Kontiola paying off for IceHogs -- The Blackhawks enticed center Petri Kontiola to come here after four years in his native Finland to see just what their investment of a seventh-round draft pick in 2004 could return. They may have had an idea the dividends would be OK, but no one could have expected this. In his first year in the AHL, Kontiola, 23, is running amok at both ends of the ice for one of the best teams in the league. He's finished second on the team in assists (50) and points (68) and paced the IceHogs with a plus-17. He's peaking at playoff time, finishing the regular season on an 11-game scoring streak (4-13). Kontiola's value runs even deeper than that. Rockford can push out Martin St. Pierre as its legitimate No. 1 middleman, but one-line teams don't go very far. Kontiola's emergence gives the IceHogs the second half of a legitimate one-two punch. "We may have a 1 and a 1A," Rockford coach Mike Haviland said of St. Pierre and Kontiola. "Konti can break open a game. When you play with him, you better have your stick ready in the offensive end. He's got a tremendous skill level. I think he's opened our eyes as an organization." Chicago got a close-up look. Kontiola developed so quickly in North America that the organization gave him 12 games up top, where he contributed five assists. "That's the only reason I came to North America, to play with the Blackhawks," Kontiola said. "The last couple of years I played pretty good back home. It was my time to play at another level. I'm not a first-rounder or second-rounder. I don't think they expected a lot." Around the AHL -- The Syracuse Crunch ended the season with a 15-game winning streak, the second-longest in AHL history behind Philadelphia's 17-gamer in 2004-05. ... As a sign of appreciation to fans, Crunch captain Zenon Konopka bought the first round of beers for several hundred adults at a season-ending party. ... Springfield (35-35-5-5) finished .500 for the first time since 1998-99. ... Providence finished with 55 wins (tied for the third-most in AHL history) and 117 points (third all-time), and set an AHL record with 28 road victories this season. ... Rockford's Troy Brouwer finished with 25 power-play goals, two shy of the AHL record. ... Manchester's Teddy Purcell and Brian Boyle are the first teammates to finish 1-2 in rookie scoring since Stephan Lebeau and Benoit Brunet for Sherbrooke in 1988-89. ... Wilkes-Barre/Scranton registered 100 points for the third consecutive season. Philadelphia (1996-99), Rochester (1998-2001), Milwaukee (2003-06) and Hartford (2003-06) are the only other teams in AHL history to achieve that feat. ... Hartford finished 50-20-2-8 for 110 points, which sets a franchise record for points and ties the team mark for most wins in a season. ... Grand Rapids center Darren Helm, who is from Manitoba, made no friends in his home province last week. He was sent down from Detroit just in time to score three goals in two games against the Moose. Grand Rapids won both, costing Manitoba second place in the North and home ice in its first-round series vs. Syracuse. ... Wilkes-Barre/Scranton honored retiring enforcer Dennis Bonvie by giving him the seat in the home penalty box. It has a plaque mounted on it with an etched picture of Bonvie that reads 'Professional Hockey's All-Time Penalty Minutes Leader.' He finished his career with 84 goals, 191 assists and an all-time record 4,493 penalty minutes in 871 AHL games. ... Chicago is the first team with consecutive 300-goal seasons since Philadelphia, from 1996-98. ... Of the seven goalies used by Manchester in 2007-08, six also played in the NHL with the parent Los Angeles Kings this season. ... Hamilton's 208 goals scored set a franchise record for fewest in a season. ... For first-year Grand Rapids coach Mike Stothers, this year marks the first time in his six seasons as a head coach and in his last 14 seasons as a coach at the NHL, AHL and OHL levels that his team will not participate in the postseason. ... The Griffins' Carl Corazzini set a single-season franchise record with 274 shots on goal. He also became the first player to ever lead the team in games played (80, tied), goals (24), assists (36), points (60), power play goals (12) and game-winning goals (5).